Fiat CEO Marchionne needs the approval from a majority of the 5,500 employees at the Mirafiori plant to increase productivity at Fiat's unprofitable Italian operations and revitalize an alliance with Chrysler Group LLC. MILAN (Bloomberg) – Rocco Carella, one of the longest-serving workers at Mirafiori, Fiat S.p.A.'s biggest factory in Turin, Italy, is willing to work as many as 120 extra hours a year and give up some strike rights. He says he has no choice. Fiat CEO Sergio Marchionne is counting on workers like Carella to overshadow his opponents on a vote over concessions for a 1 billion euro ($1.3 billion) investment in the oldest of Fiat's six Italian auto plants. More than 63,000 people, including Nobel-Prize winner Dario Fo, have signed an online petition against the plan. Graffiti threats against the CEO, with symbols of the 1970s Red Brigades terrorist group, are scattered in the streets of Turin. Marchionne, 58, needs the approval from a majority of the 5,500 employees at the Mirafiori plant to increase productivity at Fiat's unprofitable Italian operations and revitalize an alliance with Chrysler Group LLC by sharing production for Jeep SUVs and Alfa Romeo luxury cars. In a similar referendum last June, about 60 percent of workers at Pomigliano near Naples, Fiat's least productive factory, supported a reorganization plan. Marchionne may win today's vote by a similar margin, according to Rocco Palombella from Uilm, one of five unions that backed a Dec. 23 agreement. Results of the vote will be available as early as this evening. The CEO, who says he may shift production abroad, wants to increase the plant's capacity utilization by adding shifts, cutting breaks and fighting absenteeism. His tough talk has made Mirafiori the most important issue in Italy the past two weeks, with daily front-page coverage by all major newspapers and prompting commentary from political leaders including Prime Minister Silvio Berlusconi. Fiat plans to produce as many as 280,000 cars and SUVs annually at Mirafiori for the Jeep and Alfa Romeo brands as part of its venture with Chrysler. Production will begin by the fourth quarter of next year. The European carmaking operations could generate a profit of 390 million euros in 2011 if Fiat were to shift all production to Serbia and Poland, said Kristina Church, a London-based analyst at Barclays Capital, who predicts a loss for that business of 855 million euros for this year after a 684 million-euro loss in 2010. “Exiting Italy could add 3 euros a share to our core Fiat valuation, though that would also entail negative headlines and short-term outlay,” Church, who has an “overweight” rating on the stock, wrote in a Jan. 4 note. Fiat, which separated its trucks and tractors division this month, added 4.5 cents, or 0.6 percent, to 7.83 euros at 10:11 in Milan. Before today, the stock had gained 16 percent this year, after rising 51 percent in 2010. This week, the automaker won an additional 5 percent in Chrysler, boosting its stake to 25 percent after the U.S. carmaker met a performance-related target. 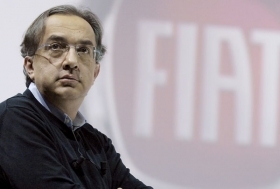 A win for Marchionne isn't guaranteed, even though unions which support the plan represent 70 percent of the workers, according to the results of 2009's internal union elections. Fiom Cgil, Fiat's biggest union which represents 10,000 of the carmaker's 83,000 workers in Italy, was the only group that refused to sign the Dec. 23 accord, saying the plan curtails workers rights and worsens their conditions. Fiom called a strike for Jan. 28 and said it may take legal action. In addition to extra hours, workers would face shorter breaks and postpone lunchtime until the end of a shift. Abnormal absentees would risk having their pay withheld and unauthorized strikes face disciplinary action. Mirafiori is part of Marchionne's 20 billion-euro investment project dubbed “Fabbrica Italia” to revamp Fiat's five remaining Italian car plants excluding Termini Imerese, which will stop producing cars by the end of 2011. Fiat aims to make 1.4 million vehicles annually by 2014 from 650,000 in 2009. At the Detroit auto show, Marchionne said that he “will take my work elsewhere” if he fails to win a majority. Fiat would look into “alternatives the day after. It may even happen the same night,” he told reporters in Detroit. Between 1998 and 2008, Italian productivity gained 3 percent, compared with increases of 22 percent in Germany and 18 percent in France, according to Bank of Italy Governor Mario Draghi. Labor costs rose 29 percent in Italy, versus Germany's 20 percent gain. The workforce at the 2 million-square-meter Mirafiori site, which was inaugurated in 1939 in the presence of dictator Benito Mussolini, reached 50,000 in the 1970s. The number fell in subsequent decades as Fiat opened new plants in the south and moved production abroad. Italian car output dropped from 1.7 million vehicles at the beginning of the 1970s to about 659,000 in 2008, according to the U.S. Department of Transportation. In Detroit, Marchionne has greater success in winning labor support. The United Auto Workers Union has agreed not to strike before 2015 under an accord also extended to General Motors Co. designed to revive U.S. automakers after they emerged from bankruptcy in 2009. The night before the vote that started yesterday, thousands of Fiat workers took part in a candle-light march organized by Fiom to protest Marchionne's proposal. The CEO's supporters held a crowded assembly at the Gallery of Modern Art in Turin.